Power & Promise event unites donors and students. Sara Pool’s father has been incarcerated for attempted murder since she was 6. Her mother died of an overdose in 2010. At the age of 15, she dropped out of high school to earn enough money to survive. For Ms. Pool, MA ’16—who this spring completed a master’s degree in speech-language pathology—continuing her education had been an uphill battle. And yet, while at GW she did a clinical externship at the Johns Hopkins Hospital, where she helped patients regain the ability to speak and swallow; she volunteered at a homeless shelter; and in September, she starts a job at a Seattle veterans’ hospital. Her journey, in short, has not been easy. “Do I pay to rent my textbook, or do I buy groceries?” Ms. Pool remembered asking herself. But, as she told more than 400 people in April at the annual Power & Promise Scholarships and Fellowships Dinner, that changed when she received the Lambert Graduate Stipend in Arts and Sciences. 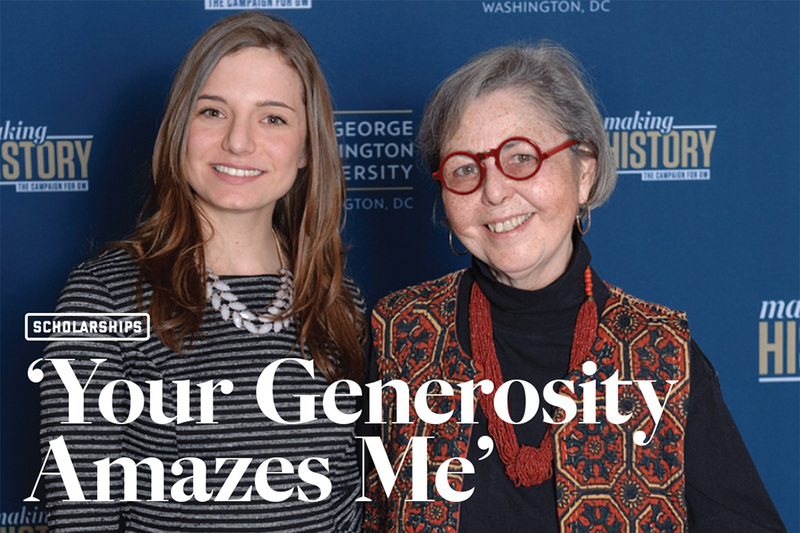 Funded by Janet Lambert and her late husband Eugene Lambert, BA ’57, the award goes to a continuing graduate student who is at risk of leaving GW due to financial hardship. “I don’t have to make those choices anymore,” Ms. Pool said, blinking back tears. From the podium, she looked directly at the woman who had made that possible. Donor-funded scholarships, like those feted at the event, are one prong of the university’s financial aid commitment, along with university funds and grants from outside entities, such as the federal government. During the 2015-16 school year, donors contributed more than $13 million to Power & Promise. What makes Power & Promise unique is that it is entirely funded through philanthropic dollars. During the 2014-15 school year—the most recent year for which figures are available—GW provided $174 million in financial aid to undergraduates. Full-time undergrads received an average of $29,917 in need-based aid and an average of $18,756 in non-need-based aid. More than 70 percent of GW’s full-time undergrads receive financial aid. GW has about 11,000 undergraduates and 14,500 graduate students. The annual Power & Promise Dinner brings together scholarship recipients with their benefactors, and the meeting often shows that the relationship is not one-sided. “I’m so proud of Sara,” she said.